Can row covers stop cucurbit bacterial wilt, and are they cost effective? 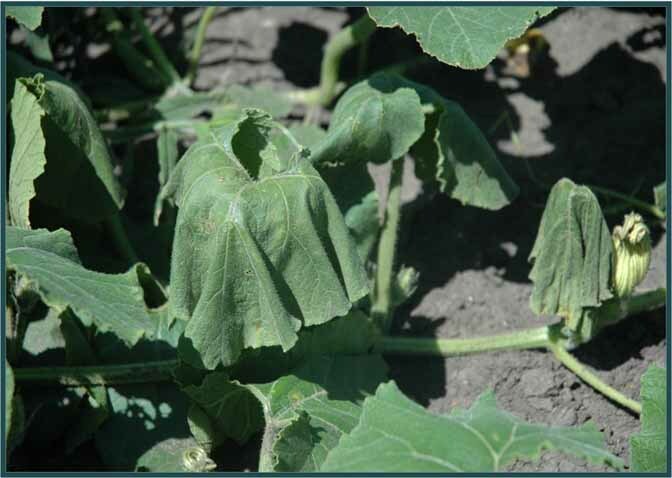 Bacterial wilt is a major challenge for North Central Region cucurbit growers. This disease, caused by the bacterium Erwinia tracheiphila, can wreak havoc on all types of cucurbit crops except watermelon. Leaves and stems wilt and dry up, and infected plants typically die. See photo below. Cucumber beetles are part of the bacterial wilt story. Two species, striped and spotted cucumber beetles, carry the bacterium from plant to plant, and infection often happens through beetle feeding wounds. Fighting bacterial wilt means fighting cucumber beetles; the main defense against the disease is stopping the beetles. Many strategies have been tried to beat the beetles. Most growers rely on insecticides, but chemical warfare can require many applications per year, which is expensive and may also damage non-target insects, including the bees that pollinate cucurbit crops. Other tactics, such as trap crops and chemical lures, are still in the experimental stage. Organic growers have an especially difficult struggle to grow highly wilt-susceptible crops such as cucumber and muskmelon, because organically approved insecticides are not very effective against cucumber beetles. In fact, some organic growers won’t plant these highly susceptible crops due to worries about bacterial wilt. 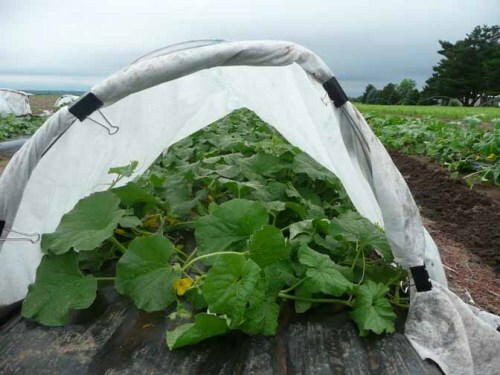 Row covers are made of lightweight fabric and are suspended above the plants on wire hoops. See photo below. All edges of the fabric are secured in the soil to hold the fabric in place and to exclude pests. Spunbond polymer row covers such as Agribon(R) and Reemay(R) have gained a foothold with North Central Region cucurbit producers because the covers warm the soil, speed up crop maturity, and protect against extreme early-season weather (frost, hail, wind, heavy rain). Row covers also have potential as a defense against bacterial wilt because they keep out cucumber beetles. As the soil warms up in the spring, cucumber beetles emerge from the ground with one mission: zero in on cucurbits. As they munch on the leaves, bacteria from their mouthparts and feces (frass) end up on the feeding wounds and enter the plants. Soon the plants start to wilt. Row covers keep out the beetles during the vulnerable early-season period. Most growers remove row covers once flowering starts. Our research at Iowa State University (ISU) several years ago showed that deploying row covers from transplanting until the start of flowering could delay bacterial wilt. But sometimes the wilt would catch up by the end of the season, so the end result was still dead plants. What if the row covers could stay in place a bit longer? Researchers in Canada and Africa found major insect-pest control benefits if they kept the row covers in place for 10 more days past the start of bloom. We thought this delayed-removal idea was worth a try in Iowa. With funding from North Central IPM Center and EPA-PESP grants, we ran 6 field trials at ISU research farms in Gilbert and Muscatine (central and eastern Iowa respectively) in 2007, 2008, and 2009. Muskmelon (cv. Athena) seedlings were transplanted to field plots and immediately after transplanting, seedlings were covered with Agribon® AG-30 row covers supported by wire hoops, with the edges buried in soil. Row covers were removed at start of flowering. Row cover ends were opened at start of flowering to enable pollinator access, and covers were removed 10 days later. After a bumble bee hive (Koppert Biological Systems Inc.) was inserted under one end of the row cover at start of flowering, the row cover was re-sealed and then removed 10 days later. No insecticide applications were made during these trials, so that we could see the full effect of the row cover practices. After row cover removal, were monitored the plants every week until the start of harvest for incidence of bacterial wilt (percent of plants that died). Row covers are not cheap, and they take time to set up and remove. But can they pay for themselves? To begin to answer this question, we made a partial budget to analyze costs and returns for each treatment. Revenue was calculated by extrapolating mean yield per subplot to a per-hectare basis, and multiplying by local wholesale ($3) and direct retail prices ($6) per 5-lb melon. We calculated net returns by subtracting production cost of each treatment from gross income on a per-hectare basis. In Iowa and nearby states, bacterial wilt occurs sporadically; sometimes devastating, and sometimes nearly absent. How can the sporadic nature of the disease be factored into economic calculations? As a first step, we did a sensitivity analysis across treatments that compared several scenarios for the frequency of occurrence of years with bacterial wilt: 0, 5, 10, 15, and 20 of 20 years. Bacterial wilt appeared in the three field trials held during 2007 and 2008. At Gilbert in 2007 and Muscatine in 2008, delaying row cover removal by 10 days resulted in significantly less bacterial wilt than when row covers were removed at the start of flowering. In the trial at Gilbert in 2008, all row cover treatments suppressed bacterial wilt effectively and resulted in equivalent marketable yield that exceeded that in the non-covered control. In 2009, bacterial wilt was absent in all three trials and row cover treatments had little impact on yield. Delaying row cover removal and opening row cover ends increased costs by a further 1% due to labor, whereas inserting bumble bee hives raised costs by a total of 18% due to purchase of bumble bees and labor to install them under row covers. For trials in which bacterial wilt occurred, average annual returns under both price scenarios were much higher for the delayed-removal strategies than for either the removal-at-anthesis (the current standard commercial practice) or no-cover controls. All row cover strategies reduced projected returns in site years without bacterial wilt. In the sensitivity analysis, the highest annual returns occurred under the no-disease scenario for all treatments, and returns declined as the proportion of years with wilt outbreaks increased. Our Iowa field trials showed that delaying row-cover removal by 10 days can provide season-long protection of muskmelon against bacterial wilt. This strategy proved to be an effective alternative for controlling bacterial wilt and cucumber beetles without insecticide applications. It could replace or reduce the need for insecticide sprays, and could be especially valuable for organic growers, who lack effective insecticides against cucumber beetles. Results of the partial budget analysis suggest that when bacterial wilt epidemics occurred, the delayed-removal row cover strategy would deliver more consistent returns than either removing them when flowering starts or not using covers at all. The sensitivity analysis suggested that cost effectiveness of the delayed-removal strategy is affected by how often bacterial wilt outbreaks occur. The strategy was economically advantageous when bacterial wilt occurred in half or more of the growing seasons, but was a drag on returns when wilt was absent or less frequent. For growers the advantage of using row covers will depend not only on the likelihood of disease occurrence but also on planting date, melon prices, availability of labor, and viability of effective alternatives to suppress the disease. Symptoms of bacterial wilt in muskmelon. Photo by Jean Batzer. Row cover on wire hoops over muskmelon with ends open to allow entry of pollinators. Photo by Erika Saalau.